El Monstro Del Mar, the Australian underground monster movie directed by Stuart Simpson that’s been making waves on the festival circuit this year, has won the Best of Fest award at NYC’s Royal Flush Festival, which was held at the world-famous Knitting Factory on Oct. 11-18. 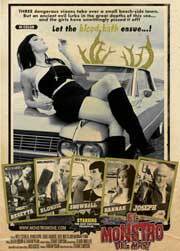 The film, which was recently reviewed on the Underground Film Journal, is a modern-ized throwback to the classic grindhouse cinema of Russ Meyer and Roger Corman. Three female hired killers hide out in a sleepy seaside village, only to awaken a monstrous creature that rises from the ocean’s depths to feast on human blood. 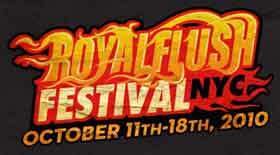 The Royal Flush Festival is a nine-day music and film event held in Brooklyn at the Knitting Factory. The fest was originally conceived as the E. Vill City Film Festival in 2005, but joined forces with the magazine Royal Flush and rechristened itself just this year. In addition to Best of Fest, Royal Flush gave out eight other awards — which are called the “Skullies” — to both feature length and short films in categories for documentary, narrative, animation, music video, comedy and more. Other winners include Shan Nicholson’s look back at NYC’s music and art scenes in the ’70s, Downtown Calling, for Jury Award – Best Documentary; Dan Eberle’s dialogue-free revenge thriller Prayer to a Vengeful God for Jury Award – Best Narrative and Audience Award – Best Narrative; Jenna Payne’s Feline Frenzy for the One of a Kind Award; Shane Ramon’s Suicide for Best Comedy Short; and more. The full list of award winners is below. The jury panel of the fest consisted of U.S. Director of Shooting People Ingrid Kopp, documentary filmmaker Liz Nord (Jericho’s Echo: Punk Rock in the Holy Land), and New Filmmakers curator Bill Woods.